This morning as we went about our chores, The Goat Herd commented on how laden the fledgling apple and pears trees are. We stood shoulder to shoulder, smug little smiles tugging at the corner of our mouths, dreaming of pear crumble and apple cake, cider and perry, and chomping into our very own Granny Smiths and Beurr Bosc Pears. Then a sinister cloud appeared on the horizon of our joined imaginings: December Drop. Fruit Drop, December/June Drop, call it what you will, is the abandoning ship of baby fruit just as it starts to look promising and every year it causes great anguish here on the Homestead. Following the old Forewarned is Forearmed path, we decided this year we would front foot it. Chores be damned! We would do whatever it took to beat this lemming-like fruity behaviour once and for all; Google and gardening books: enlighten us. The first thing we found was a huge amount has been written about why fruit drop occurs and, like most things attached to the art of gardening, a great deal of it points the finger firmly at ineptitude on the part of the gardener. Some say it’s caused by lack of water or, conversely, too much water, others site poor soil condition, then there’s not enough spraying, too much spraying, no feeding, over feeding. Seriously, trying to break into this gardening gig is a hiding to nothing. There seemed nothing else for it but to slink outside and apologise to the trees for their misfortune in ending up in our ham-fisted backyard. But no! Just when things looked their bleakest, The Renovator (who had been frantically tapping on his phone – we thought he was just texting and ignoring our plight, the selfish…) yelled eureka or something along those lines. It turns out that enlightened gardeners actually celebrate December (or June) Drop, thinking of it as natural thinning; the fruit trees version of survival of the fittest. Fruit trees are hot-wired to produce way more blossom than they can possibility support to safe guard against losses due to bad weather or plague, pestilence or whatever. If none of these things occur and the tree gets a dream run, it’s left with too many dependants on its limited resources. The answer: get rid of the weaklings. See, it wasn’t us after all! Down the garden we charged to photograph the evidence of fruity abundance before Mother Nature stepped in; not a moment too soon, as it turned out. As we type, a roaring Nor’ Wester is flinging blossom, sand and debris every which way, thankfully obscuring a clear view of the baby trees. 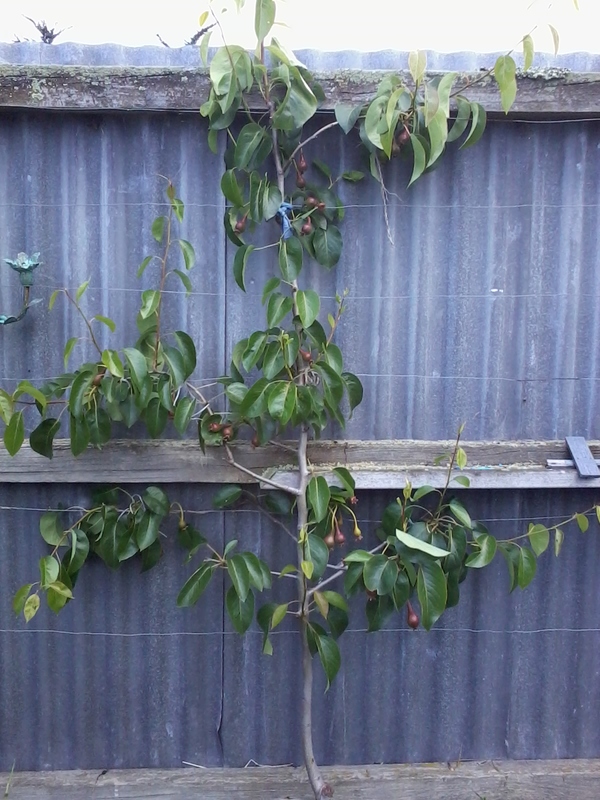 Please let there be just a few hardy fruit left adhering to the tree tomorrow. After all, we’re still only half way through November! 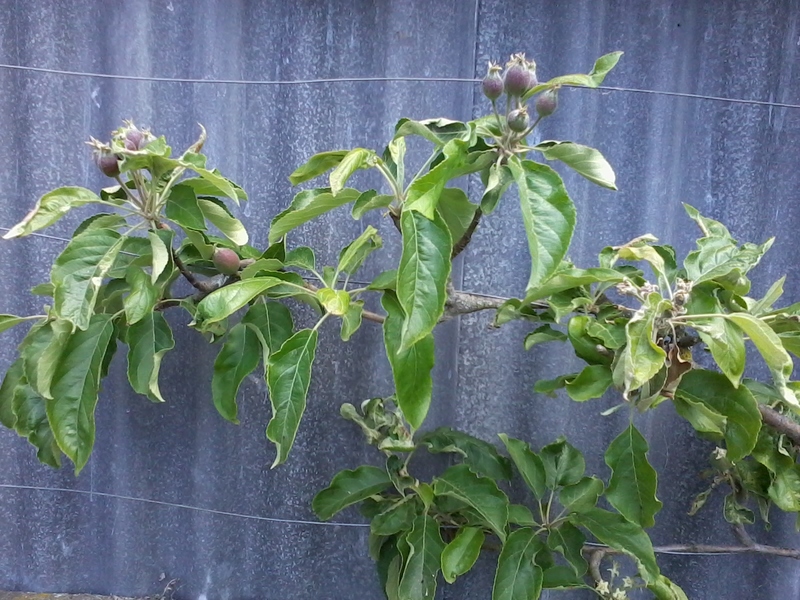 This entry was posted in Garden, Union Homestead and tagged allotment, Aotearoa, apple tree, apples, Christchurch, December drop, farm, fruit, fruit drop, fruit tree, fruit tree care, fruit trees, gardening, Homestead, Homesteader, homesteading, June drop, NaBloPoMo, New Brighton, New Zealand, organic, organic gardening, Otautahi, pear, pear tree, pears, Permaculture, small holder, small holding, trees, urban farm. Bookmark the permalink. I have got my fingers crossed. Let us know how the trees survived. Pears in red wine…oh yes….mmmmmm I bet your kitchen smells divine! I found out about the real reason for June drop just a couple of years ago, and it makes so much sense. I don’t take any care at all of our big old trees, so I deserve whatever bad things happen in the way of loss of fruit, but it’s still a relief to know that June/December drop is actually a good thing. Hmmm pears in red wine…do you think I could do that with the pears I bottled in the summer? We always have June drop but this year it was not good enough and we had to pick and throw away about 100 unripe plums to stop the boughs breaking under the weight of a bumper crop.